Spending time with your family at a Round Rock Express game is really all it's cracked up to be. The excitement, the excellent selection of food and drinks, the music and cheering, combined with two grassy lawn areas and a Fun Zone with a playground for the kids.... it all adds up to good, old fashioned family fun time! On Monday, June 13, 2016, bring your princesses out to the field for Princess Night. Special ticket prices apply for the evening in addition to $1 hot dogs and sodas all night long. Ticket packages include a ticket, tiara and inclusion in the costume parade (6pm) on the field. Infield reserved seating is just $16, $10 for lawn seating. Curious to know more about attending a Round Rock Express Baseball game? Read our Top 5 Favorite Things About the Round Rock Express. 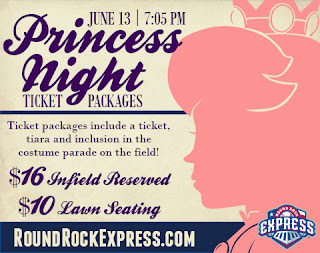 Would you like to win tickets to the Round Rock Express Princess Night? We are giving away two family four packs of tickets to Princess Night on June 13, 2016! What do you have to do to win? Complete the form below by 9 am CST on Friday, June 10, 2016. The winners will be chosen randomly and notified by email with 24 hours to respond to claim prize. The tickets hold no cash value. Tickets cannot be transferred or redeemed for different dates. Must be 18 years or older to enter. Parking is $8 at Dell Diamond.